We're pleased to present an exciting Discount Prescription Program from CVS Caremark. This program was created to help save money on the high cost of prescription medications. It covers every member of your family - even your pets. Simply present your card at a participating retail pharmacy and save up to 75% off the regular retail price of many prescription drugs. Finding a pharmacy is easy; over 67,000 pharmacies nationwide such as CVS, Walmart, Walgreens, and Rite Aid will accept your discount card. No enrollment form, no membership fee...Just one card for immediate use! Use the Discount Prescription Card anytime your prescriptions are not covered by insurance or Medicare insurance programs. This is NOT insurance. Discounts are only available at participating pharmacies. 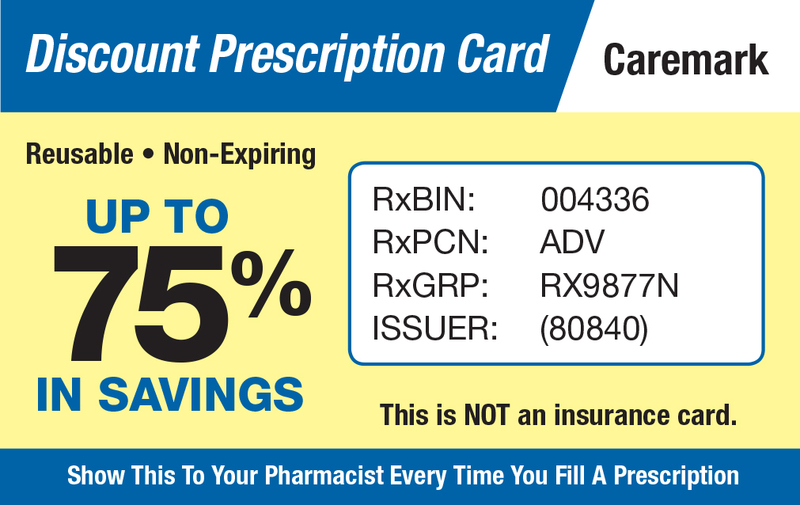 By using this card, you agree to pay the entire prescription cost less any applicable discount. Savings may vary by drug and by pharmacy. Savings are based on actual 2018 drug purchases for all drug discount card programs administered by CVS caremark®. The program administrator may obtain fees or rebates from manufacturers and/or pharmacies based on your prescription drug purchases. These fees or rebates may be retained by the program administrator or shared with you and/or your pharmacy. Prescription claims through this program will not be eligible for reimbursement through Medicaid, Medicare or any other government program. This program does not guarantee the quality of the services or products ordered by individual providers. We do not sell your personal information. Call the member toll-free number on the back of your ID card to file a complaint related to this program. Note to Texas Consumers: You may contact the Texas Department of Insurance if you remain dissatisfied after completing this program’s complaint process. Gerber Life is a distributor of the card, and is not involved in the operation of the CVS Caremark Discount Prescription Program.